Scientists have been urged to become more involved in public debates about their research or risk it being dominated by minority "maverick" views. The warning comes from Lord Martin Rees, president of the Royal Society. He said debates on issues such as climate change and stem cells needed to be based on sound scientific research. Lord Rees outlined his concerns during a ceremony to honour Professor Stephen Hawking for his contribution to theoretical physics. "Technology and science are changing the world in the 21st Century faster than ever, and in more drastic ways," he told the BBC's Today programme ahead of the ceremony. "The main theme of my talk is that science and the world faces ever more complex issues such as climate change, stem cell research and nuclear power. "How the science is applied and prioritised should not just be decided by the scientists; these choices should be made after the widest possible discussion by the public." Lord Rees, who is also the English Astronomer Royal, added that such discussions should be based on sound science. In order for this to be achieved, he said that scientists needed to engage the public's interest by making it clear what the benefits were and what the experiments involved. He described the approach taken by scientists involved in stem cell research as a good example of what he was calling for. "In the UK, we have a good system of regulation for stem cells because the scientists engaged with parliamentarians and journalists early on... that is the model we should follow." Lord Rees said that there was a current tendency for minority "strident" views to get exaggerated, leading to an unbalanced debate. "It used to be controversial whether smoking caused lung cancer, it used to be controversial whether HIV caused Aids. Now, there are a few mavericks who deny those things. "In the case of climate change, I think the debate is going the same way in that there is a strong consensus that it is a serious matter," he said. 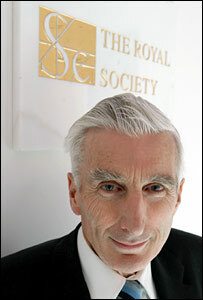 Lord Rees outlined his concerns on Wednesday in the Royal Society's 2006 Annual Address, which also saw the Lucasian professor of mathematics at the University of Cambridge, Stephen Hawking, being awarded the society's prestigious Copley Medal for his outstanding contribution to theoretical physics. Sir Martin Rees: Prophet of doom?